The market has been moving with plenty of momentum and velocity activity this past week despite the rather weak performances of the major indexes. June is rarely a month that offers so many great swing trading opportunities, but this June is proving to be a solid month for swing trading. Swing Traders need to be able to quickly distinguish between a “momentum” run and a “velocity” run, as this alters how long you can hold the stock, how far it is likely to move, how it will behave when it meets resistance, and where to place trailing profit stops. In recent years, many swing traders have learned a very bad habit that may be tough to get rid of: the exit-too-soon bad habit. The market had been in a platform market condition for so long and most swing traders were unaware of this fact. They attempted to trade platforms with swing style trading strategies and quickly were whipsawed out of their trades, or took losses after a day or two when the stock was actually moving up and they had been in profit. This leads to many swing traders taking profits within the trading day to avoid losing what limited profits they had made. If a swing trader continues to do so now, with a true momentum market underway, they will miss out on the significant profit potential that momentum runs offer. That is why it is now critical to learn to distinguish between a momentum run and a velocity run. When a trader can see the distinct differences, the proper trailing profit stop can be determined to allow the stock to run as far as it will go before exiting the trade. Instead of settling for 10- or 25-cent profits, technical traders can earn several points over a few days’ time with lower risk. Volume continues to rise during the run up. Volume declines before price reverses most of the time. Price rarely overlaps day to day, and often has small common gaps between days. A “Shift of Sentiment” pattern in TechniTrader’s Quiet Accumulation (TTQA), which is an accumulation/distribution indicator. 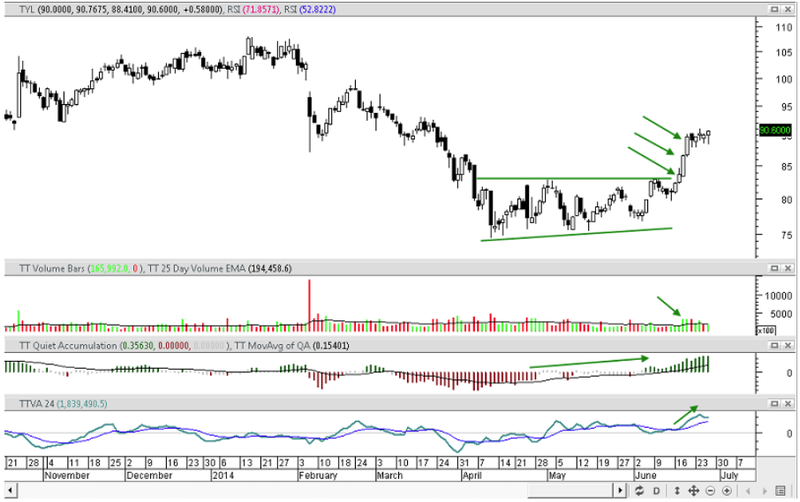 The TechniTrader Volume Accumulation (TTVA) indicator, which is a volume oscillator, shows steady upside accumulation. Tyler Technologies (TYL) has one of the many new types of bottoms. This is called a basing bottom and tends to form as Dark Pools buy the stock incrementally over extended periods of time. This basing bottom also is compressing upward, an early indication of a base bottom about to complete. The velocity run is marked by the green arrows on both price and volume. The accumulation/ distribution indicator has started a shift of sentiment and the volume oscillator is rising prior to the stock moving upward. Entries with this kind of pattern are made as the bottom starts to move up. In this example, the stock had a 4-day run so far. The trailing profit stop must be a velocity run trailing profit stop to protect more profits due to the higher energy and higher risk of sudden profit-taking. Velocity runs are unique to momentum and velocity market conditions. These are found in many charts right now and are excellent swing trading opportunities. © 2014 Decisions Unlimited, Inc. DBA TechniTrader®. All rights reserved.